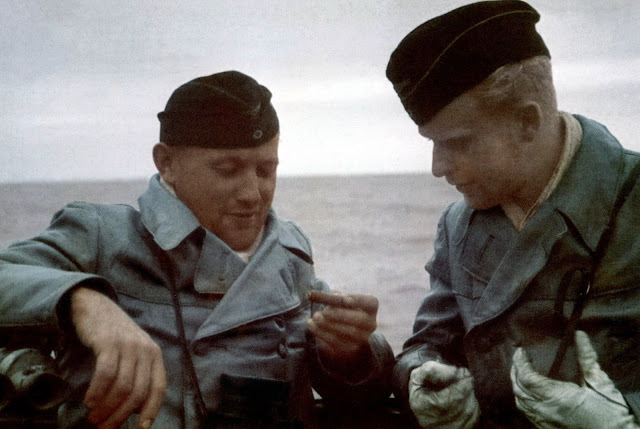 A rare color image showing Kriegsberichter Oberleutnant Gerhard Garms (right) in U-404's conning tower, speaking with a member of the crew. From the spring to autumn of 1942 Oberleutnant Garms was a photo and film correspondent attached to the U-boat flotillas based on the Atlantic coast of France. There he took countless still photos and movies of submarines leaving and returning to port, which have appeared often in the post-war literature. Garms also went along on at least two operational U-boat sorties. His first operation was the eighth patrol by U-552 under Kapitänleutnant Erich Topp, during which the submarine operated off the American coast. It was on this patrol that Garms filmed the brightly-lit skyline of an American city. Footage shot during this operation, which lasted from 7 March until 27 April 1942, appear in "Der Deutsche Wochenschau" Nr.599, which was shown in theaters in Germany and occupied Europe. In August 1942 Garms boarded Kapitänleutnant Otto von Bülow's U-404 for his second patrol. Garms' father had established Nordmark-Film in Kiel in 1920 and had taught him the film trade from the ground up. For this assignment Garms came up with something special. A mount for his Askania Z camera was built to his specifications in the workshops in St. Nazaire and mounted on the port side of the U-404's conning tower. Tests showed that the camera was capable of functioning to depths of 60 meters in the pressure capsule. 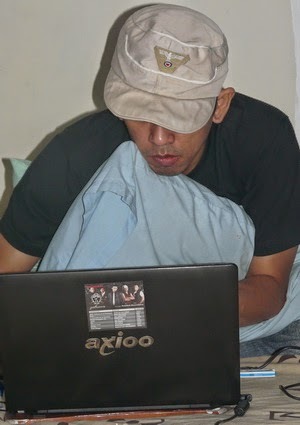 Garms wanted to film the submarine diving and carrying out underwater maneuvers, and he succeeded. The Askania Z was a sophisticated 35-mm camera which the Askania AG had been producing in Berlin since 1929. This type of camera was used, for example, to shoot the UFA film "Blauer Engel" (Blue Angel) with Marlene Dietrich in 1929-30. The weight of the camera without lens was 25 kilograms. Garms films are familiar with all U-boat enthusiasts, the newsreel images showing the conning tower of a U-boat nearing the surface, finally emerging and then plowing through the Atlantic. Other impressive footage shows waves breaking the conning tower in heavy seas. I was really want to get some more detail and information about the sad story of a soldier but your blog helped me so much thank you for sharing it.